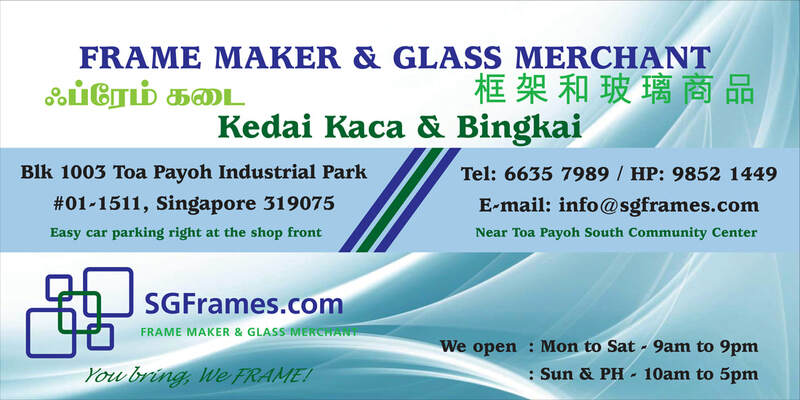 SGFrames.com We are Professional Frame Make and Glass Merchant in the business since 15 years. We drive for customer satisfaction and committed to deliver Unique Service as we are in the business since 15 Years. We are in business for more than 15 Years. We provide range of service from Framing to Glass works. Customised Framing with Personalised Service @ Customer Oriented Pricing....With a variety of offerings to choose from, we’re sure you’ll be happy working with us. Look around our website and if you have any comments or questions, please feel free to contact us. We do Door Delivery and Onsite Installation for framed pictures and glass.